Here we are again, starting off a new year. A new beginning. There always feels to be an expectancy and urgency at the start of a new year, that perhaps somehow things will be different than last year, or the year before that. That somehow we’ll get it “right” or “better” this year. We’ll be more disciplined in our health, finances, work, relationships, or finally answer that call to something greater than where we are right here, right now. Then when things, i.e., life, doesn’t change as quickly as we might like, we fall into disappointment or resignation. Sound familiar? Remembering that we are enough at any given moment takes feral courage. I know this has been true for me especially around my work as an artist and the time it takes to create some of these paintings like the “Wheel of the Four Winds” shown here on my easel (learn more below). In a production-oriented society, when the expectation is to churn out a bunch of paintings every year, my work is devotional and paintings take time to come to life on the canvas. Consider Tibetan Thangka paintings or Christian iconography for example. Art as a sacred practice. In this way, it is a challenge to make a living only with my art but this is where I am called to be right here, right now. Through my training in non-violent communication (NVC), I have learned the practice of self-empathy and am trusting in the journey even when it feels at times that I am failing in comparison to cultural expectations, or my own. So, during our new year’s meditation and sweat lodge at my spiritual community, the word that came to me for the year was expansion. This intention is general enough to hold spaciousness for what unfolds this year in relationships, work, and in life, but without too many expectations loaded on to it. Am I playing it safe in not wanting to be disappointed if I don’t touch as many people with my work as I would like or don’t meet the love of my life? Maybe, but for me trusting in the path is the path and right now I am simply staying open and listening for guidance. What about you? Any intentions for the year? I finished Wheel of the Four Winds (30×48″) during the last week of the year and is shown here on my easel. 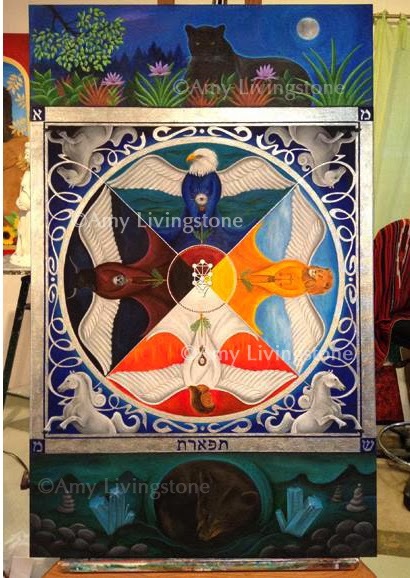 Although I read Rabbi Gershon Winkler’s “Recovering the Shamanic in Judaism” several years ago, I didn’t actually start putting paint to canvas until January of 2013 after a long gestation period. This has been a 4-season journey and I have traveled psycho-spiritually around the medicine wheel myself this past year finding myself once again as we begin this new year in a place of visioning–around life and my work. This insight, however, did not become fully clear to me until I was coming to completion on the piece. Such is the mystery and healing power of the creative process. According to these teachings which draw from the mystical wisdom of Kabbalah: The North (eagle/Uriel guides), element of water, is the place of soul/mystery out of which we emerge. Journeying left to the West (bull/Raphael), element of earth, we experience a death or period of darkness at some point. Within this landscape we journey to South (human/Michael guides), element of fire, for cleansing and reflection. Emerging in the East (lion/Gabriel), we find ourselves at the place of balance and new beginnings. We then arrive back in the North, the place of vision. Repeating again and again until we reach a higher consciousness. Resonates with my life’s journey. How about you? There is a lot of animal medicine in this shamanic painting including the panther, the guide of the upper realm (the place of giving), and the bear, the guide for the lower realm (the place of receiving). While working on the horses pulling the chariot or merkava (medicine wheel) with silver reins, I discovered that this in the year of the Horse in Chinese Zodiac! The transliteration of the Hebrew is tifaret, the place of beauty and balance that lies in the middle on the “Tree of Life” and at the very center of the medicine wheel.